GATEWAY to the Barrington Tops National Park, the closest listed world heritage area to Sydney. 3 Hours drive north of Sydney - 1.5 hours drive north of Newcastle - 2 km Gloucester railway station. 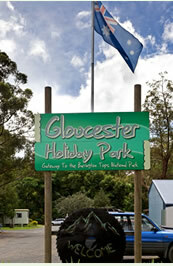 The Gloucester Holiday Park is nestled in 20 acres of natural bush alongside the Gloucester river and at the foot of the Bucketts Mountain Range. Ideally located for bush walking and bird watching. The Park offers a wide range of comfortable accommodation and sites. Stroll to the main street shopping and tourist information center. Conveniently located next to heated outdoor Olympic size swimming pool and hydro therapy pool. Recreational facilities, include tennis, croquet, cricket, football, rugby and bowls.